QUESTION: You have been really hard on the “gold promoters”, yet you are long-term bullish on gold. 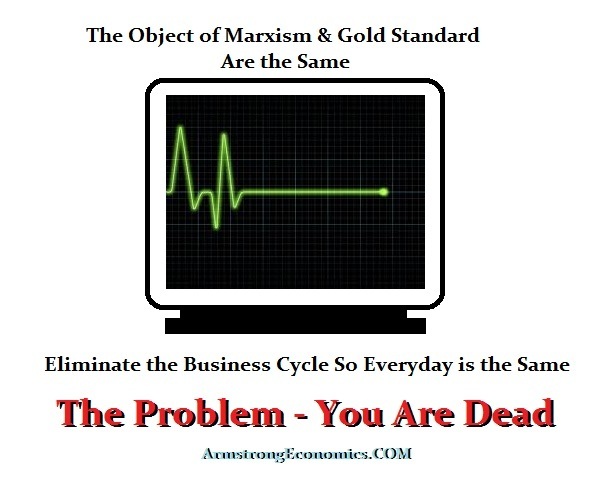 Why would gold rise if not for all the reasons put forth by the gold promoters? ANSWER: I was a gold market-maker. Personally, I prefer gold. I prefer to handle it. But whatever my personal feeling about gold, that is irrelevant when it comes to forecasting. I have learned to separate my “personal” likes and dislikes from the cold light of ascertaining what truly makes the world tick. Gold just “feels” better in your hand than paper – yes agreed. However, that does not mean that is reality. There is a huge difference. It would be nice if we all got along. But we do not. A lion will kill to eat. That is nature. We cannot live in a dream world. Some people are vegetarians. That makes them personally “feel” good. It will not stop the lion from killing you when it is hungry. Understanding gold is the same. Whenever markets peak, immediately thereafter, the human emotions involved are in a state of denial. The gold promoters have thrown everything from fiat to systemic manipulation as the reason why they are right yet the market moves against them. The very same state of denial dominated the atmosphere for the first 3 years in Japan following the 1989.95 bubble top. I became famous in Japan because I simply said sorry – the government will not be able to prevent the decline. 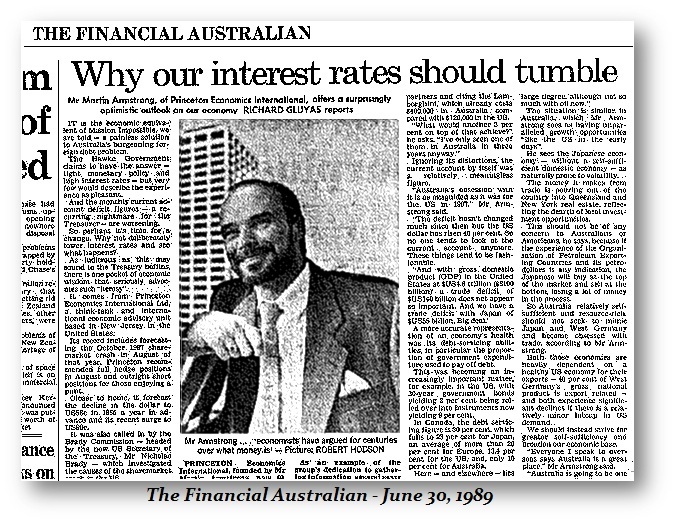 In Australia back in 1989, there too, the analytical crowd touted that the A$ would collapse because of the current account deficit. I stood up and said wrong. The A$ would rally not decline and the current account deficit was expanding BECAUSE of the foreign investment into Australia that sent the A$ higher. The economic community fails to understand capital flows and is clueless about even the accounting system. This is why Milton Friedman came to see me lecture in Chicago. He grasped what I was saying and could see it in his mind’s eye. Milton encouraged me to speak out and could see I had a front row seat. The MAJORITY must be wrong. That is what makes the markets move. The rally in gold from 1999 was simply a realignment with gold rising to keep pace with value on a marginal basis. I was blamed for creating the takeover boom of the ’80s because I was advising many of the takeover traders. 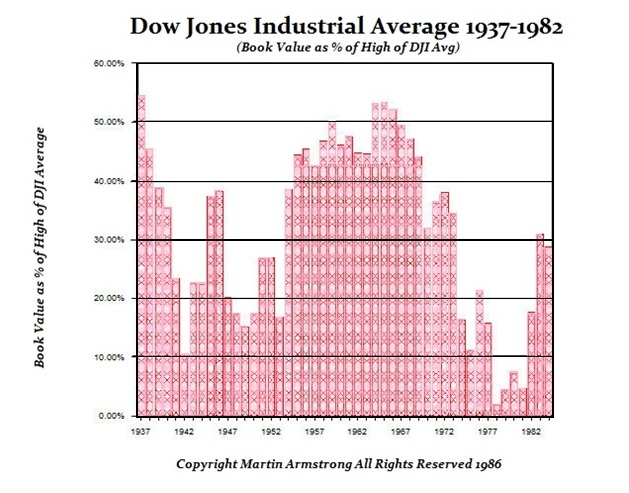 I was lecturing around the world showing the Dow Jones Industrials from the book value viewpoint and demonstrated that the market was seriously undervalued as the Private Wave began in 1985. I illustrated that you could buy a company, sell all its assets, and double your money. That showed the market was UNDERVALUED and not OVERVALUED. The 1987 Rally was like gold up for 13 years. It was the beginning not the end of a readjustment. We forecast that the 1987 Crash was the low and new highs would be made by 1989. Again, the majority were calling for a 90% drop in the Dow. They were wrong as always. That was why when the Dow was at 1,000 we forecast it would rise to 6,000 over the next 10 years and 12,000 26 years from the 1974 low. 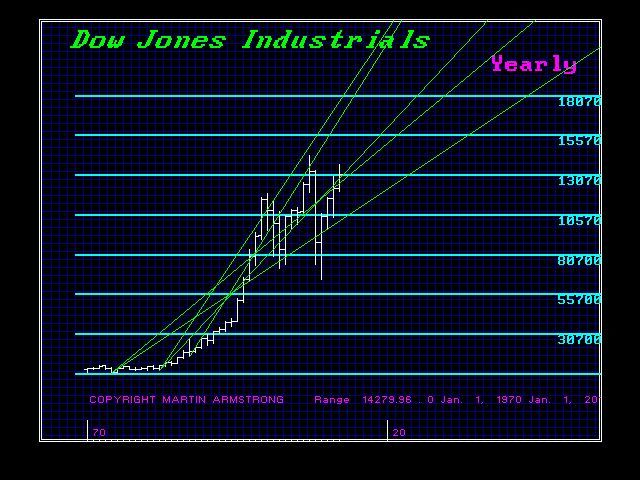 The Dow reached the 6,000 level in 1996 and 26 years after the 1974 low we reached 11908 in 2000. Sorry, we were off by 100 points but the timing was correct. With systemic inflation that ALWAYS infects money even when it was coin, assets rise in proportion to the supply of money over time. It is not an immediate trend. There are lagging periods and then abrupt readjustments. The rally in the Dow from 1985 into 2000 was the first stage of this readjustment. Gold will do the same thing in time. The rally in gold from 1999 was a readjustment. It was not a bull market in terms of real value – only nominal. What I mean by that is the simple fact that gold has not exceeded the 1980 high in real terms. That requires gold to exceed $2,300. So the BULL MARKET in gold, like I have just described in the Dow, has yet to take place. The gold promoters have no sense of timing or how markets even move. They were just selling product in which they were conflicted with self-interest. That puts them in the category of simply a state of denial and every uptick is real with every down tick being a manipulation. That is nonsense and all markets oscillate up and down. The Dow readjusted when the ECM turned from PUBLIC to PRIVATE – not before. This is not stuff that can be determined by personal opinion. Nobody can forecast looking at fundamentals. The markets respond on an interlinked basis. This is why the majority must be WRONG when society tries to reduce every move to a single cause. We have only two possibilities. (1) We get the phase transition in the Dow now going into 2015.75 whereby the Dow nearly doubles in value creating the bubble top, or (2) the Phase Transition is postponed into 2025 for the next 8.6 year wave. This depends upon the debt crisis. If we see the sovereign debt unravel now, then capital will flee into tangibles. There will not be the flight to quality so sovereign debt will not be the alternative but tangible assets. Thus, gold will rally at that time in place of government bonds. Because there is little gold at the current price relative to the cash, its price must rise to the price level in the $5,000 area. If we back off and do not get the Phase Transition in the Dow going into 2015.75, then it is postponed until the next wave looking at 2025 for the high. We will address this in a special report. This has nothing to do with fiat and all the stories spun around selling gold. It is simply an asset. If you were to actually extend into a Mad Max event, then gold loses all value and we return to food as money. We MUST begin to understand the mechanism by which society functions. Stop the BS – open your eyes – understand that you cannot get x without y moving as well. So the gold promoters become their own worst enemy just as the Ministry of Finance in Japan. Once people saw they could not prevent the decline, they lost faith in government. The reason gold will rally is rooted in the debt crisis. Forget the fiat nonsense, hyperinflation, systemic manipulations. Who cares if there is gold in Fort Knox? Do you really think they will admit that anyway? 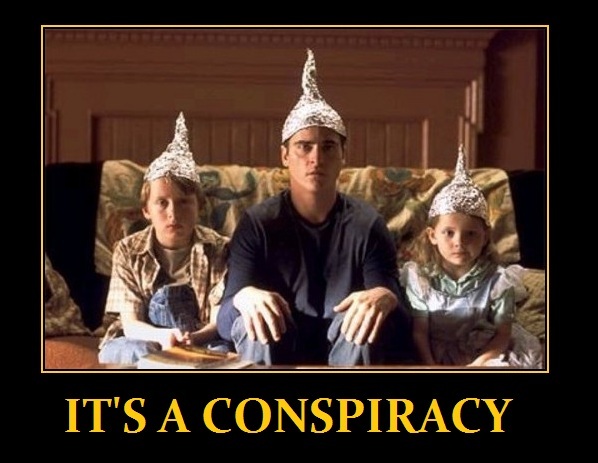 You might as well be wearing your tin foil hat because that is no reason to buy gold. Those that put out those stories cannot prove what they say. It is just nonsense if it cannot be fact. If you buy gold on BS, then you will also not sell when it is time to take a profit. It is a market – trade it. Money is only a medium of exchange. It rises in purchasing power during economic declines and falls during economic booms. That is it regardless of what it might be. Get over it! We will end up with a new currency anyway and it will not be gold backed or some fixed exchange rate that is anti-freedom. That is what Marx tried. Paint your entire body. You will die because your skin needs to breath. The monetary system is the same. It must fluctuation. Flat-line it and you kill society – you are dead. Cheer up! A new currency is coming.